Biasucci took PNB's company class in spring 2011 without any real expectation of a job. For one thing, she was comparatively short. Early on, she says, “I'd come to terms with the fact that my height would always be a deciding factor in jobs offered, roles danced and heads turned." Petite felt especially prohibitive at PNB. “In my mind it was always women that are 5' 10" with these incredible lines." Boal, however, was intrigued by her. “There was something so unique about her style—which is good and bad," he says. “We see about a hundred dancers a year that come through and take company class, and very few of them stick with you." Biasucci stuck, and Boal offered her a contract. Biasucci with PNB soloist Kiyon Gaines in Twyla Tharp's "Brief Fling." Photo by Angela Sterling, Courtesy PNB. She soon proved herself. At the end of her first season, another dancer's injury gave her an opportunity to dance Swanilda. Last on the cast list, but with a physique and personality perfect for the role, Biasucci had been tapped as an understudy. However, Boal notes, “careers are always made on what happens last minute." He felt pleased by her success. “It made you look at Leta and think, Okay, we're not just talking about a future soloist. We're talking about a talent that's going to ascend into all of the big roles." Last season's Aurora was a dream role for Biasucci, one she found both rewarding and grueling. “The characterization is conveyed so much through clarity in the technique," she says, and each act requires a very different approach. Biasucci felt at home in Act I's rapid-fire petit allégro entrance, but the ballet's demanding adagios challenged her natural inclinations, especially in the ethereal second act. She notes drily that “other ballerinas talked about how Act II was supposed to be the 'rest act,' but I had to expend so much energy on not punching everything." Contemporary choreography, integral to PNB's repertory, has been the final frontier for Biasucci, with her classical CPYB background. “At first it was scary for me," she admits. At PNB, big names like Twyla Tharp and Crystal Pite setting their work on the company has deepened her understanding and experience. Biasucci has also worked closely with choreographer and former PNB dancer Andrew Bartee, whom she considers a source of inspiration. The respect is mutual—Bartee loves teasing new movement qualities out of Biasucci. “It's like her skin breathes when she moves," he says. “I've told her before, I wish I could be in her body for a day, because everything looks like it feels good, even if the movement's awkward." “She's very gutsy in what she'll attempt to do," says Boal. “I actually love when she's unsuccessful, because she has these amazingly creative ways of still finishing a combination when she's clearly falling to the right." Biasucci's willingness to try anything extends beyond the studio. By night, she takes college courses in arts management through PNB's Second Stage program. “The dance career requires that you are worried about yourself," she says. “To learn about how the organization operates has allowed me to see the arts as a much bigger, broader entity." 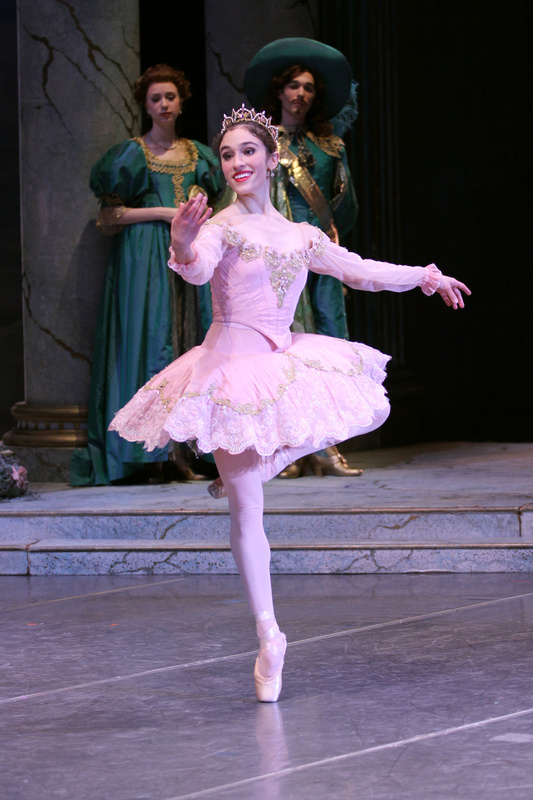 Biasucci in "Sleeping Beauty." Photo by Angela Sterling, Courtesy PNB. Biasucci is poised to shift the long-established image of the PNB ballerina. But a company standard arises from exceptional dancers who win the audience over to the qualities that set them apart. “There was probably a time when Patricia Barker went into roles, and people thought she was longer and lankier than what a ballerina should be," says Boal. “Then Kaori Nakamura went into a role, and they thought, She's so tiny, we picture someone more like Patricia Barker. But Leta is pushing the model in a new direction, and people have really come to embrace her as a talent." It's anyone's guess where Biasucci's talents will lead her next, as Boal is first to recognize. “That's what is so exciting about Leta. She's going to go in 10 directions. Ten great upwardly-mobile directions."